Our passage from the south from the Seychelles to Madagascar in 2007 was unique for us as it was our first all-upwind passage to date. This made our speeds somewhat slower, and the trip more bouncy. Although we chose the best weather window we could, the window slammed shut on us about a day earlier than expected, so we sought refuge for 10 days in conveniently placed Farquhar Atoll. But our adventures started before we'd even had a chance to clear into Madagascar officially! Cruising along the coast of Madagascar was delightful. 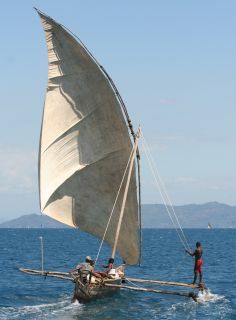 Although the country is very poor, the villagers sail everywhere in their colorful and picturesque dhows, making good use of the interesting winds that blow one direction in the morning, and the other direction in the afternoon. The list-server we use to send out our newsletters was down for the entire time we cruised Madagascar, so most of these newsletters were sent to only a few folks, as our on-board email can't handle large lists of recipients. Tues 7 Oct 12° 02' 48° 45' 158 29 27 60-45° Veer around N Madagascar, anchor in Rantabe Bay! In 2009 we returned to Madagascar on our voyage north from South Africa towards the Seychelles. Our short "hop" from Mayotte to Madagascar was completed in about 41 hours, on a mostly glassy sea. We were lucky to have a few hours of sailing breeze during the day, something we weren't really expecting! You can read about our short passage in our Ocelot Returns newsletter.